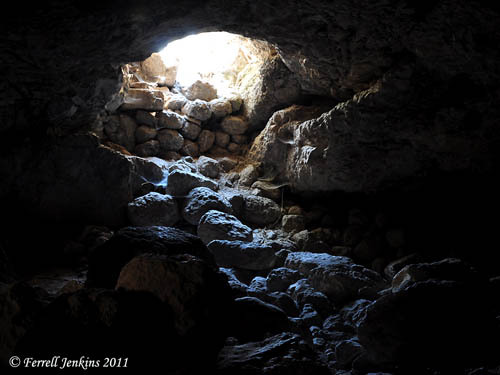 One of the important places on our “bucket list” was the Cave of Adullam. The main reason we had never visited Adullam before is that it requires a long, difficult, walk or a four-wheel-drive vehicle. We made arrangements with Haelah Desert Tours, a company at Aderet, a moshav on the north side of Adullam, for a guide/driver who could take us there. Once we reached the forested mound we enjoyed a wonderful view to the north, east, and south. Our guide, Daphna, inquired first about our interest in the site. How did we even know about the site, she wondered. She is a Sabre, a native-born Israeli, who lives at Aderet. The view below is to the east where you will see the border between Israel and the West Bank. The central mountain range is visible in the distance. 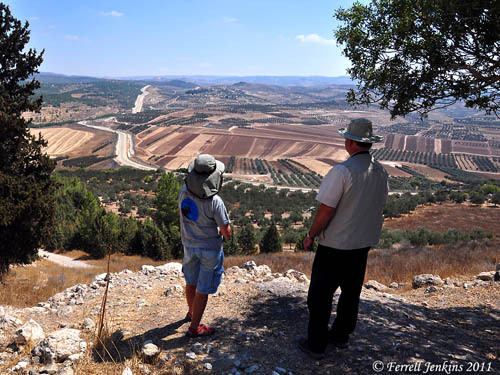 Daphna, our guide, and Leon look east from Tel Adullam. Photo by Ferrell Jenkins. There is a large cave at Adullam. Is it the cave where David stayed while fleeing from Saul? Can’t say, but if it was not this one it had to be another one near by. The next photo was made from inside the cave. View north from interior of the Cave of Adullam. Photo by Ferrell Jenkins. Adullam is significant in several biblical accounts. Here are a few. Judah stayed with an Adullamite man named Hirah. He married the daughter of a Canaanite man named Shua. The episode of Onan and his failure to fulfill his responsibility to bring up children to his deceased brother (the Levirate marriage; Genesis 38:3-10). Joshua defeated the king of Adullam during the Conquest (Joshua 12:15), and became one of the Shephelah (lowland) cities of the tribe of Judah (Joshua 15:35). The cave of Adullam is associated with David. When he left Gath he went to Adullam before sending his parents to Moab for safety. In fact, David spent much time at Adullam. I suggest you read the entire account in 2 Samuel 23:13ff. Just like David did about three centuries earlier. One more point. Jesus was a descendant of David and Judah, both of whom had an association with Adullam (Revelation 5:5). My thanks to Gordon Franz and Carl Rasmussen with whom I have corresponded about Adullam. Update. In my orignal post I made a mistake in saying that Judah married the daughter of Hirah. I caught this mistake a few days ago and have now corrected it. Judah married the daughter of a Canaanite man named Shua. This entry was posted in Archaeology, Bible Lands, Bible Places, Bible Study, Israel, Photography, Travel. Bookmark the permalink. Using your pictures tonight in our Bible study of I Samuel:24 Thanks and may God bless you in your travels. I am so blessed to have found your site. My visit to Israel included most of the popular places of the bible, and your photos and information have enriched my trip so much. I long for the day that I can return, but until then, I am once again visiting Israel through your blog. Here is a link that I found that details other info on the cave. Thank you for the great pictures. I always wondered what the cave might look like!